Perfect for students at band 4.0 and above, this study guide has EVERYTHING you need to prepare for IELTS Academic or General Training. Understand the test and improve your score with advice, tips and clear explanations. Exercises cover every question type, so you choose what to practise. Develop test-taking strategies with EIGHT official practice tests – the first one with step-by-step guidance. Audio for the listening exercises and practice tests, videos of the Speaking test are on the DVD-ROM. 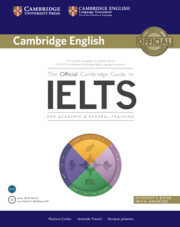 Alternatively download them all with The Official Cambridge Guide to IELTS App. A range of essential skill-building exercises and focus on exam strategy helps you to maximise your grade. Eight official IELTS tests provide plenty of exam practice. Prepares for both the General Training and Academic Modules. Answer keys provide clear explanations to help you learn and improve your score. Suitable for students of all bands (4.0 and above), you can choose how much or how little language development you need. Speaking test videos help prepare you for this hard-to-anticipate part of the exam. Accompanying app delivers the video and audio content in an alternative format for portable devices (App Store or Google Play). 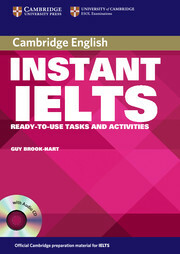 This is a photocopiable resource packed with a range of ready-to-use IELTS exam practice activities.